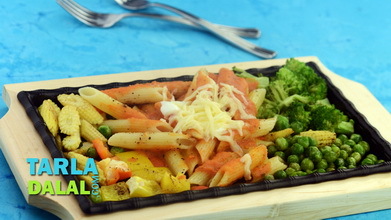 White sauce, with its soothing texture and flavour, plays host to not just perfectly cooked fusilli but also a medley of colourful and crunchy veggies. 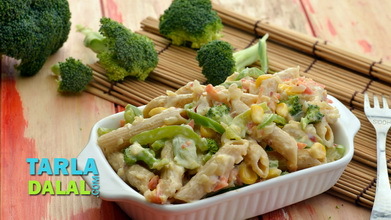 Colourful capsicums, vibrant broccoli and crunchy baby corn endow this dish with a splash of colours, which is pretty to behold and tempting to bite into! 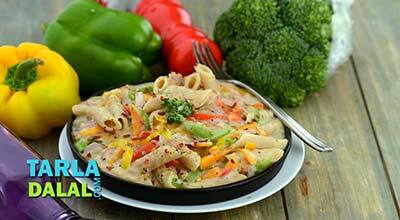 Wonderfully flavoured with spices and herbs, the Pasta in White Sauce is a real delight to devour. Combine the milk, plain flour and salt in a deep bowl and whisk well till no lumps remain. Keep aside. 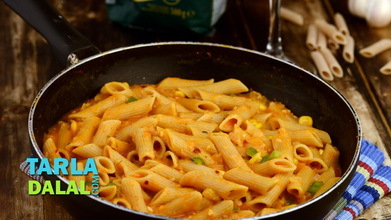 Add the yellow, green and red capsicum and zucchini and sauté on a medium flame for 2 minutes. Add the broccoli and baby corn and sauté on a medium flame for 1 more minute. 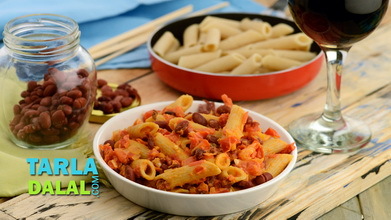 Add the milk-plain flour mixture, chilli flakes, mixed herbs, cheese and little salt, mix well and cook on a medium flame for 2 minutes, while stirring continuously. 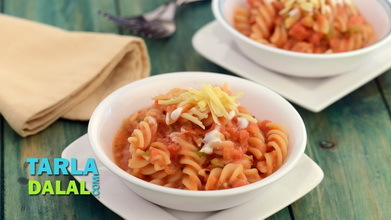 Add the fusilli, mix well and cook on a medium flame for 1 to 2 minutes, while tossing gently. Loved this recipe, but just made a bit of change, I first dry roasted the wheat flour and then after it cooled added to milk, so the raw flavour of flour is lost. I added capsicum, slivers of carrot and mushroom too. 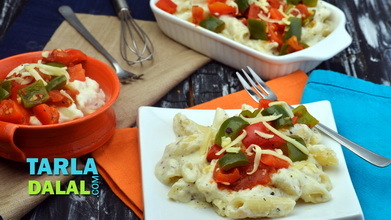 Tarla Dalal Hi Smita, we are delighted you loved the recipe. Please keep posting your thoughts and feedback and review recipes you have loved. Happy Cooking!